The Converse Blog: 'S Saturated Saturday: New Converse.com coming soon, Converse Racing? 'S Saturated Saturday: New Converse.com coming soon, Converse Racing? Yesterday around 3:30 to 4:00ish the new and improved Converse.com went live for a test. Lucky for me, I was able to be online while this was happening, and I must say that I was really impressed with the first version of the new website. I won't spoil any of the fun for when it finally does launch but you should really enjoy it, especially a new section that really represents what Converse has become to so many people. I am not sure when the launch will be of the new site but keep your eyes peeled because I feel like it will happen soon. 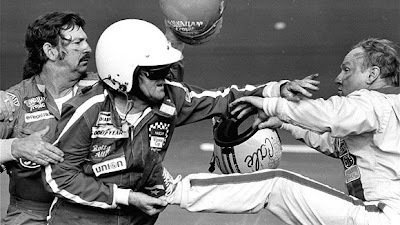 Our next stop on Saturated Saturday is way back in 1979 at the Daytona 500. So why is this on The Converse Blog, well you don't have to look any further than Cale Yarborough's feet. He's wearing some Converse with the Star and Chevron. I am pretty sure these are just some running shoes, but they could actually be racing shoes. Either he was wearing them while racing and getting his fight on. It also looks like some track employees are wearing them too. So there may have been some kind of sponsorship with Daytona that year. I'd really like to know if there is anyone out there in the world wide inter-web that might know for sure. That's it for today, thanks for checking out the blog and I hope you all enjoy the Kentucky Derby today! Go I want Revenge, Join In The Dance! maybe they'll finally have the Weapon option turned on for Converse One when the new site goes live. it says "coming spring 09" when you roll over the Weapon 86, and last time I checked it was spring, 2009!